WOW! This is exactly what Planet Asia needed...a shot in the arm of pure adrenaline from a producer who can put him back on top. No question Muggs is a legend, and his work with Cypress Hill and Wu-members over the years have shot the Soul Assassin into the internationally known arena as a lasting force! 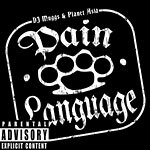 Hard production... just that raw and dirty type, help Planet Asia really open up his lyrical arsenal fitting the aggressive nature of each song perfectly throughout the course of Pain Language. I don't think I'm alone when I say that Asia's last album Jewelery Box Sessions was an album I really didn't feel, but Pain Language is on a completely different level, one that I can't even compare to any of his previous releases... it's that good! Featuring B-Real, Sick Jacken, Killah Priest, Prodigal Sun, GZA and more! The Track with Sick Jack is Filthy!! !